The updated camp website is camps.nautilusva.com. This pool based scuba camp is the perfect way for kids to start their diving adventure. Each day is full of fun and engaging activities that teach about the underwater world, including official PADI Seal Team Aqua Missions conducted in the pool. These action-packed Aqua Missions introduce kids to the basics of scuba diving and snorkeling in a way designed just for them. Some of the adventures include underwater photography and building a ‘space station’ underwater plus each participant gets their very own Log Book to keep track of all the fun! Upon successful completion, students become members of the PADI Seal Team and are ready to move on to the Specialty Aqua Missions in Level II. Ages: 8 – 14. Prerequisites: Comfortable going under water. Participation in a PADI Bubblemaker or Discover Scuba Diving experience recommended. Scuba gear and fins provided. PADI Seal Team members continue the adventure a second week by completing the PADI Master Seal Team Aqua Missions like diving on a ‘wreck’ and using a flashlight underwater on a ‘night’ dive in the pool! Master Seals become more confident in their dive skills as they improve buoyancy and underwater communication. Upon successful completion, students become members of the PADI Master Seal Team and are ready to take the PADI Junior Open Water Diver course. Ages 8 – 14. Prerequisites: Kids Scuba Camp – Level I or Junior Open Water Diver Certification. Scuba gear provided. This is the real deal – upon successful completion students will receive the PADI Jr. Open Water Diver or PADI Open Water Diver (ages 15+) Certification. The first three days are academic sessions at our onsite classroom and shallow water skill dives conducted at a local pool. The last two days are four open water dives conducted at Lake Phoenix Scuba Park (requires overnight stay). Transportation between classroom/pool and to/from the scuba park included. Ages 12 – 18 (ages 10-11 may participate in Open Water Scuba Camp if they are Master Seal Team members and have instructor recommendation). Scuba gear provided. Whether you’ve just completed your PADI Jr. Open Water Diver course or have many logged dives, PADI’s Junior Adventure Diver course gives you the confidence, skills and experience to take your diving to the next level. You will fine tune your dive skills, meet new dive buddies and gain confidence as you explore the special dive activities this camp offers. All programs conducted by Certified Instructors and Assistants. Participants must complete the 2019 Camp Registration Form and our Scuba Camp forms packet for the appropriate level including the RSTC Medical Statement Form. Paperwork packets must be received at least one week prior to camp start. Scuba gear provided includes BCD, regulator, SPG, dive computer, wetsuit, tanks and weights. 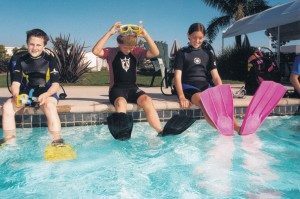 Where required, students must provide their own personal gear including scuba quality mask (tempered glass), snorkel (non dry-top), open heel scuba fins, and hard sole scuba boots. Every camper should also bring a pack lunch, water bottle, swimsuit and change of dry clothes each day (towels are provided). Minimum of 4 students, maximums vary per camp. Drop-off & pick-up available at both stores. 8:30am-5pm in Sterling; 9:00am-5pm in Vienna. $150 deposit due upon registration, includes $50 non-refundable registration fee. Any cancellations or changes made after April 1st will be subject to cancellation or change fees. No refunds will be given after June 1. Final payments due 30-days before camp starts. Discounts available for participants enrolled in more than one camp session OR any siblings enrolled in any session, $50 per registration after first enrollment.